Anacortes Yachts is a full service yacht brokerage that is a leading marine brokerage, utilizing the resources that buyers and sellers look for and require. We are centrally located in the Northwest's hub of yachting, Anacortes, Washington, the threshold to the San Juan Islands, Gulf Islands and the Inside Passage to Alaska. 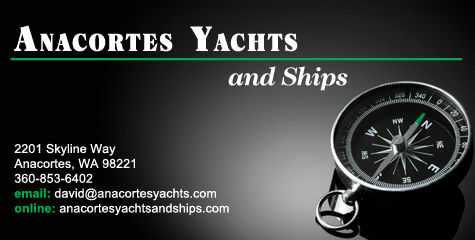 Anacortes Yachts and Ships has worked to bring buyers and sellers of fine yachts together from all parts of the globe. Cross boarder transactions, interstate and international shipping, purchases and sales in different currencies, are just a part of what we do to serve the client. We facillitate trades, whether it is smaller for larger, sail for power, or the other way around. Looking for a yacht for charter service, or looking to sell a yacht that has been in charter? 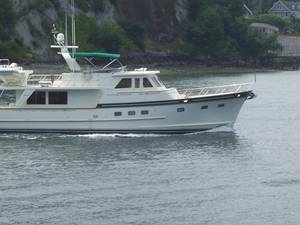 Whether it is a yacht-for-hire, or a bareboat charter vessel, Anacortes Yachts will provide you with the resources and the options to purchase or to sell a charter vessel. Call us or email with your questions and yacht brokerage needs. Re-powered with rugged John Deere 6068 diesel engines that are complimented by sea chests and ships machinery more likely found on a commercial vessel. This Grand Alaskan was arguably Arthur Defever's best design.This one built in the Tania yard. Large and tough enough to take on the open oceans in safety and comfort, yet you can still get this vessel into every marina with ease. Access to the huge engine room is also simple and unobtrusive. Get out on this timeless yacht...with the full covered walk-arounds, the proper Portuguese bridge, and the expansive flybridge. Active stabilizers, two gensets, air conditioning and reverse cycle heat, hydraulic bow and stern thrusters plus hydraulic windlass are the beginning of a long list of machinery features of this yacht. State of the art navigation and communication systems virtually all new 2016-2017. Everything above the flybridge except the structure itself virtually new 2016-2017. Intelligent and exceptional care has been given to this fine vessel.